I loved this installment! As always, sad that it ends and I can't continue everyday listening to Evie's story. I am Team Death and loved that Arik was so much a part of this book and we got to watch him develop and change. A must listen! I am so emotionally invested in these characters and have been for years. I squee from happy and sob from heartbreak. I am one part impatient for the next book to get here and one part dread that it will be over. As always , Emma G. kills it with narrating (in a good way) loved it! Stop with the love triangle already!!!!! This was my least favorite book in the series. I just can't with the love triangle anymore. SPOILERS AHEAD: I've been rooting for Evie this whole time, but finding it hard to care about her anymore when she's selfish and loves/sleeps with whoever is in front of her at the time. No loyalty? No commitment to either guy? A 17 year old pregnant girls sleeping with two guys? Gross!! I kind of just want Jack and Aric to kick Evie out and marry each other. They're both too good for her. There was too little action in this one as well. Waaayyyyy too much Evie whining. Very little strong empress in this one. And with all that said, I couldn't stop listening. I was completely hooked. Pissed off, but hooked. That's why I still had to give it at least 4 stars. I just hope the next book settles the love triangle early and doesn't drag it through to the end. I think we're all over it and want to focus more on the game. Both K. C & Emma Galvin Slay in this book! First of all if you haven't read this series stop reading this review right now and go read it (or listen to it, because Emma Galvin is QUEEN and slays narrating this). Seriously, this is one of my all time favorite series ever. Kresley Cole does an amazing job with the world building, the character development, the ROMANCE, and the non-stop action. 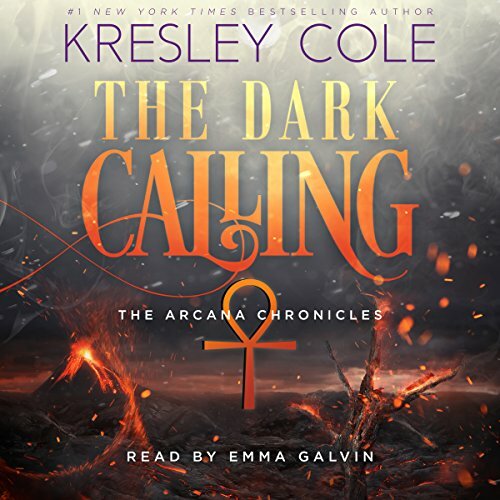 Like the previous books, I couldn't stop listening to The Dark Calling. While I wouldn't label this book as a "filler" book, it is definitely leading everything to the end and starting to wrap up the story. However, my mind was still blown away at the plot twists and I was on the edge of my seat throughout the entire thing. We have different POV again, from Aric, Jack and of course Evie, which really helped expand the story and give the characters some more growth. Also, let me just say I have no idea what #team I'm on. Team Jack? Team Aric? Can I be Team Both? Is that possible?! And... I had some serious tears. Like, really. I was cleaning my kitchen listening to this when I screamed out "NOOOO!!!!!" in anguish and scared the crap out of my toddler (don't worry, she's fine). It did break my heart though (no spoilers). Anyway, I've been waiting on this book FOREVER and it did not disappoint me. I'm just super sad I finished it so quickly and now have to wait for the next one. As far as the narration goes for the audible version: As I've mentioned above, Emma Galvin slayed it. She has a way of just sucking you right into the story and you completely tune out everything else around you. I'm VERY picky with my audio books. I can't just listen to any narrator and usually have a hard time finding one I love, but Emma Galvin is on POINT, ya'll. She has the best accent for Jack and Aric both. I honestly forget I'm only listening to one person. Definitely can't wait to check out more of her work! I liked the series and finished the book in a day but enough with the love triangle already. Evie flip flopping between the two guys make her very unlikable. It almost felt like she was looking for and hanging on to excuses not to be with death. Can you really blame the guy for flipping his switch after millennia of betrayal? She kept feeling bad for dragging Jack into the whole arcana mess. Then leave the poor guy be and maybe he’ll find love again later down the road. Death on the other hand can’t be with another woman besides Evie. Even though it is a hard choice, it is a rather clear choice I think. Evie should grow up, stay loyal to death, give birth to this baby that could potentially end the game and provide Jack with a reborn/nice world to live in. I need the next book!!!! I love this series, as well as the others, even though this is a lot less "spicy". even though the ending is left wide open, it's sad to see one of the guys leave. The ride that Kresley Cole started us on in Poison Princess has continued. This installment had me on the edge of my seat as well as keeping the Kelenex company going, one tissue at a time. I am even now tearing up thinking back on this one. If you are reading reviews to see if this is the book for you...I recommend starting with book one, Poison Princess. Get to know Evangeline, Jack, and Arik. Fall in love with a blonde girl who doesn't want to hurt a soul. Know the strength and determination of a boy who came from nothing. Feel for the knight that has always been perpetually alone. If you get through book one...you will be hooked to the very end.